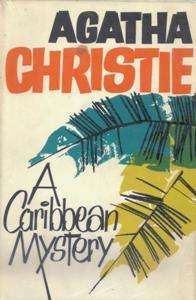 A Caribbean Mystery is a work of detective fiction by Agatha Christie, first published in the UK by the Collins Crime Club on 16 November 1964 and in the United States by Dodd, Mead and Company the following year. The UK edition retailed at sixteen shillings (16/-) and the US edition at $4.50. It features the detective Miss Marple. Two of the major characters reappear in the novel Nemesis, published in 1971 and the last novel to be written featuring Miss Marple. Jason Rafiel reappears posthumously, and his assistant Esther Walters assists Miss Marple in the early chapters of the subsequent story. This story takes place at the Golden Palm resort on the Caribbean island of St Honore. Miss Marple's nephew has paid for her to holiday there after a bout of ill health - but she is bored. She is approached by Major Palgrave, a garrulous man avoided by the other guests due to his long-winded stories. She sits, half listening, until Major Palgrave tells a story about a man who got away with murder more than once. When Palgrave asks her if she wants to see a picture of a murderer, she listens intently - but after he fishes through his wallet for the photo, he suddenly changes the subject. Miss Marple looks up to see why and sees several people nearby. The next day, when the maid Victoria finds Major Palgrave dead in his room, Miss Marple becomes convinced he was murdered. She asks Dr Graham to find the photo he mentioned, pretending it is of her nephew. Meanwhile, she interviews the others: Tim and Molly Kendal, owners of the hotel; the Prescotts, a clergyman and his sister; Mr Jason Rafiel, a tycoon with a weak heart and confined to a wheelchair; Jackson, his nurse/masseur/ attendant/valet; Esther Walters, his secretary; the vivacious American Lucky Dyson and her husband, Greg; and Edward and Evelyn Hillingdon. On the beach, Miss Marple sees Señora de Caspearo, a woman on holiday who says she remembers Major Palgrave because he had an evil eye. Miss Marple corrects her that he had a glass eye, but she still says that it was evil. Victoria informs the Kendalls she did not remember seeing the high blood pressure medication, Serenite, in Major Palgrave's room before, although it was found on his table after his death. That night, Victoria is found stabbed to death. Molly begins having nightmares. Miss Marple finds Jackson looking at Molly's cosmetics, who says that if belladonna were added to it, it would cause nightmares. The following night, Tim finds Molly unconscious on the floor, apparently having taken an overdose of sleeping pills. The police are involved, and the cook, Enrico, tells them he saw Molly holding a steak knife before going outside. Miss Marple asks the others if Major Palgrave told people about the photo. Others claim Palgrave said it was not a photo of a wife killer but a husband killer. Major Palgrave is exhumed and the autopsy reveals that he was poisoned. At night, Tim wakes up to find his wife is missing. They find what seems to be her body in a creek, but it turns out to be Lucky; the two women resemble one another. Miss Marple wakes Mr Rafiel and they go to Tim and Molly Kendall's house. There they find Tim offering Molly some wine. Miss Marple tells Jackson to take the wine away. She shows it to Mr Rafiel, saying there is a deadly narcotic in it. She explains that Tim Kendal is the wife killer, recognised by Major Palgrave. Miss Marple had thought Palgrave saw the Hillingdons and the Dysons on his right as they were coming up the beach, but later realised that he had a glass eye so could not see on his right. Tim and Molly were sitting on his left. Tim was planning to kill his wife, and so had to kill Major Palgrave when he recognised him. He also killed Victoria, who remembered the Serenite. Tim put belladonna in Molly's cosmetics to drive her to suicide. Tim had asked his wife to meet him by the creek, but Molly had been distracted by a vision due to the belladonna and wandered off. Tim saw Lucky and mistook her for Molly. He was about to poison Molly when Miss Marple came in. Esther Walters suddenly insists that Tim isn't a killer. Tim shouts at her to keep quiet. He had been planning to marry Esther, after Molly's death, because he had heard that she was going to inherit a large sum of money from Jason Rafiel. Jane Marple: An elderly spinster detective with an eye for detail and unexpected clues, with a mind like a sink. Tim Kendal: A young man married to Molly Kendal, who marries her using false references and starts the hotel (where the story takes place) with her. He is discovered to be having an affair with Esther. Molly Kendal: A pretty young woman married to Tim Kendal, who starts the hotel (where the story takes place) with him. She eventually believes she has fallen mentally ill and confides it to Evelyn, though she is being poisoned. Esther Walters: Jason Rafiel's secretary, (the widow of a drunkard) with a child in England. She strangely seems to prefer keeping herself homely instead of getting herself up 'like a houri'. Victoria: A St. Honoré native, she is the one to discover Major Palgrave's death and the mysterious bottle of Serenite. She is in an illegitimate, consummate relationship. Greg Dyson: A nature lover. Now married to Lucky, he was married to a woman who was killed by Lucky with the help of Edward. Lucky Dyson: An attractive though not young American woman married to Greg, who plotted to kill his ex-wife, along with Edward, who she tricked and seduced. Edward Hillingdon: The husband of Evelyn and an avid nature lover. He has children at a boarding school and drifts apart from his wife because he does not love her. Evelyn Hillingdon : A woman who does not love her husband Edward but puts up with him in public to put on an appearance both for their public image and for their children. Canon Prescott: Miss Prescott's brother, a member of the clergy, who opposes to his sister's rumourmongering. Jackson: Mr Rafiel's valet/masseuse/attendant who (by admission to Miss Marple) worked at a cosmetic company. He is thought of as generally thieving and undesirable. After lukewarm reviews of her two previous novels, Francis Iles (Anthony Berkeley Cox) felt that the writer was back on form in his review in The Guardian's issue of 11 December 1964: "Mrs Agatha Christie has done it again. In A Caribbean Mystery she tells the reader explicitly what is going to happen; and yet when it does, nine out of ten will be taken completely by surprise – as I was. How does she do it? For the rest, it is Miss Marple this time who is in charge of the story; and all one can guess is that the setting is a Caribbean island." Maurice Richardson in The Observer of 15 November 1964 began, "A most encouraging return to somewhere very near her best unputdownable form. ... Suspicion nicely distributed among guests, many of them raffish adulterers. Not very hard to guess, but quite suspenseful. Good varied characterisation including a particularly excellent octogenarian tycoon." Towards the end of the year, Richardson again commented on the book in a special Books of the Year: A Personal Choice column when he said, "Agatha Christie makes one of those gratifying veteran's comebacks." The Daily Mirror of 21 November 1964 wrote: "Not quite at the top of her form. A Miss Marples (sic) story which addicts won't find as unsolvable as usual." Robert Barnard: "In the tradition of all those package-tour mysteries written by indigent crime writers who have to capitalize on their meagre holidays. Nothing much of interest, but useful for illustrating the 'fluffification' of Miss Marple. Reuses a ploy from Appointment with Death." The novel is dedicated to John Cruikshank Rose, "with happy memories of my visit to the West Indies". Christie's and Max Mallowan's friendship with John Rose started back in 1928, at the archaeological site at Ur. He was the architectural draftsman and when Max was in charge of the dig at Arpachiyah, Syria in 1932, he hired Rose to be his draftsman. Rose was Scottish, and as Christie described him, "a beautiful draughtsman, with a quiet way of talking, and a gentle humour that I found irresistible." The millionaire Jason Rafiel appears again, posthumously, in the novel Nemesis where he sends Miss Marple on a case specifically because of her success in solving the events related in A Caribbean Mystery. A 1983 US TV movie adaptation starred Helen Hayes as Miss Marple and Barnard Hughes as Mr Rafiel. The New York Times says that Miss Marple has "a carload of suspects" to figure out why her friend was killed, in this film that first aired 22 October 1983. A BBC TV adaptation starring Joan Hickson was shown in 1989 as part of the series Agatha Christie's Miss Marple, with Donald Pleasence co-starring as Mr Rafiel. Few changes were made from the novel: the Prescotts and Señora de Caspearo were omitted, Miss Marple holidayed on Barbados rather than the fictional island of "St Honoré" (interestingly the name Honoré reappears as the fictional main town in the BBC series Death in Paradise that began airing in 2011), and the blood pressure medication was renamed Tetrauwolfide. The production was made and aired after the production of Nemesis, leading to some viewer confusion. In the earlier production, the part of Jason Rafiel was portrayed by Frank Gatliff, rather than Donald Pleasence. In 2014 the book was adapted for the sixth series of ITV's Agatha Christie's Marple, starring Julia McKenzie as Miss Marple and co-starring Antony Sher as Jason Rafiel, Oliver Ford Davies as Major Palgrave, and Robert Webb and Charity Wakefield as the Kendalls. The characters are much the same as in the novel, and the location is the same. At the end, Tim tries to shoot Molly rather than poison her, but the bullets of the gun have been removed. Like some of the other episodes in the previous series includes a character named for a real person. In this instance it is spy novelist Ian Fleming who makes the acquaintance of Miss Marple and is struggling with writer's block, trying to come up with the name of his hero for his latest spy novel Casino Royale. Just then James Bond (Charlie Higson) appears on the platform to deliver a speech, and introduces himself as "My name is Bond, James Bond", which ultimately interests Fleming causing him to write. What Bond inevitably talks about; "Guano" is used in another of Fleming's "James Bond" novels Doctor No. The novel was serialised in the Star Weekly Novel, a Toronto newspaper supplement, in two abridged instalments from 16 to 23 January 1965, with each issue containing an uncredited cover illustration. ↑ Iles, Francis (11 December 1964). "Review". The Guardian. p. 9. ↑ Richardson, Maurice (20 December 1964). "Review". The Observer. p. 7. ↑ "Review". Daily Mirror. 21 November 1964. p. 22. ↑ Barnard, Robert (1990). A Talent to Deceive – an appreciation of Agatha Christie (Revised ed.). Fontana Books. p. 190. ISBN 0-00-637474-3. 1 2 "Agatha Christie-A Caribbean mystery". Archived from the original on 8 June 2000. Retrieved 16 October 2015. ↑ Erickson, Hal. "A Caribbean Mystery (1983)". New York Times. Retrieved 16 October 2015.